While in Los Angeles last week, I visited the Japanese American National Museum, something I’ve wanted to do since beginning to write The Red Kimono. Before going inside, we walked around taking pictures. Thankfully, we noticed a sign that said “Go For Broke,” with an arrow pointing away from the museum. 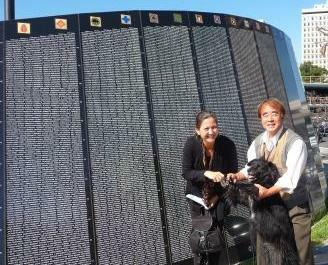 Knowing my Uncle Yoshio served in the 442nd Regimental Combat Team, (Uncle Yoshio’s Honor) I wanted to see the memorial. So we turned in the direction of the arrow and headed about a block away, toward a large, black semi-circle monument. The curved back of the monument is covered with over 16,000 Japanese-Americans who served in the 442nd Regimental Combat Team, the 100th Infantry Battalion and the lesser-known Military Intelligence Service. 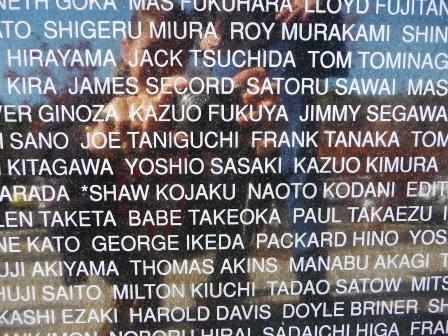 As I searched through the names for my uncle’s, a Japanese man approached me and asked if he could help. He gave us a brief history of the monument and pointed me in the direction of a computer that would help me locate Uncle Yoshio’s name. I stared at his name, Yoshio Sasaki, thinking about what it must have been like to fight for a country that had “relocated” his family (my mother included) to internment camps surrounded by barbed wire. 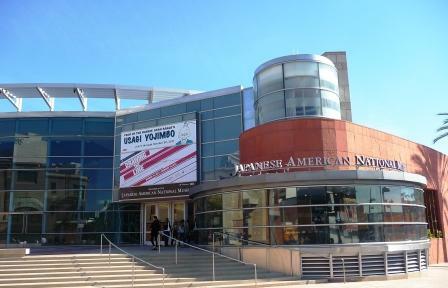 After reflecting at the site of the monument, we went into the Japanese American National Museum. There, I came upon a barrack that had been relocated to the museum. I stared through gaps and knotholes in the boards that left little privacy for the families that had lived in the tiny, primitive spaces. I imagined my mother as an eight-year old, peeking through those spaces as she searched for any source of entertainment. Then, I imagined her mother scolding her, trying to explain that each family deserved privacy. As we walked around looking at fascinating memorabilia, an elderly Japanese man approached us. He introduced himself as Frank Omatsu, and asked if we’d be interested in hearing more about the displays. 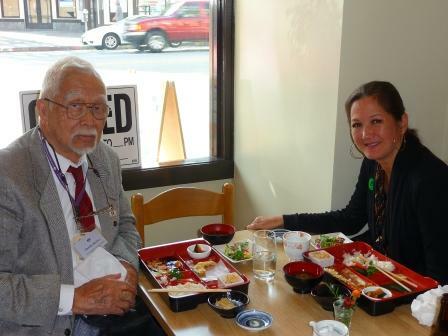 Mr. Omatsu told me other things I had not known before: that the 442nd rescued the Lost Battalion, suffering over 1,000 casualties (200+ dead, 800+ injured) to rescue 216 men trapped behind German lines; that attachments to the 442nd liberated several of the concentration camps near Dachau; that over 300 Nisei (second generation) women served in the Women’s Army Corp.
How lucky we were to be approached by this proud and humble man who so generously shared the history of this time with us. I have done much research in writing The Red Kimono, but reading words does not compare to hearing stories in the voices of those who experienced history. Yesterday, November 2, 2011, Congress held a Congressional Gold Medal Ceremony to honor the Japanese American veterans of World War II. At last, the men who fought not only the enemy, but prejudice, have been honored. 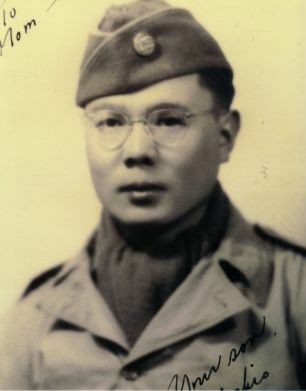 This entry was posted in Broken Dolls, Congressional Gold Medal Ceremony, Japanese-American, Japanese-American National Museum, Nisei, World War II. Bookmark the permalink. Such an insightful post. So much I never knew and can now appreciate. So glad you got to see the museum. I know it must have been inspiring on so many levels. 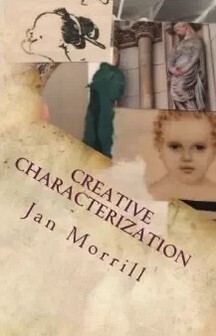 @mgmiller, when I talk about Broken Dolls, it surprises me how many people don't know that part of our history. I remember it was kind of skimmed over in our history classes. I was happy to see several classes of children visiting the museum while I was there. Thanks for commenting! I learn something new every time I visit your blog. It's sad that it took our government so long to recognized the contributions of these veterans, so many have passed away. I'm glad to visit the museum. @Russell – I agree, that the saddest part is that so many of these veterans passed away before Congress finally recognized their sacrifice. Thank you again for reading and commenting! The series "Cold Case" had a wonderful episode about a Japanese family affected by WWII confinement. I was impressed with the accurate portrayal of their treatment and how they coped.We have the greatest country on earth but it does have some blighted growing pains. This was not when wd briefly met, was it? I am still in my wake up fog… Eyes, too.